If you want to improve your accuracy before the start of the hunting season or a competition, you might want to consider the Block Black target from Field Logic. The Block comes with targets on all 4 sides which are designed to be easy to see close up and at a distance. The sturdy foam construction is capable of stopping broadheads and field tips, and you will appreciate how easy it is to pull the arrows free. Lightweight and easy to carry to the practice field, this target can help you learn how to aim and fire like a pro. 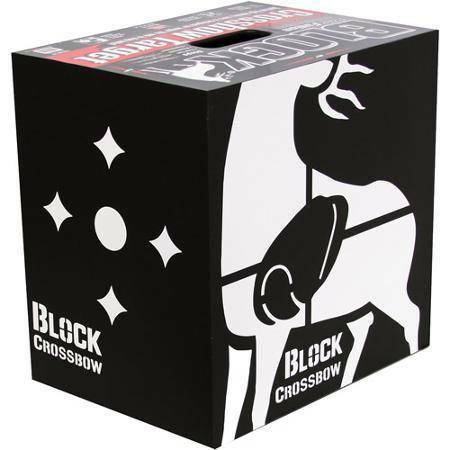 Even though this block target is excellent at improving aim and accuracy, some consumers have noted that it might not be compatible with broadheads fired from a crossbow. The amount of power behind the arrow when it hits the target can make it difficult to remove without ripping the foam or damaging the tip. Whether you are competing in a tournament or hunting game, you need to be able to fire bolts quickly and accurately. This square target from Field Logic is designed to help you improve your performance and has four sides so you can practice from any angle. The diamond and circle targets are designed to be easy to see at a distance, and will help you improve aim and arrow placement. With 4 small targets per side you can easily work on speed and accuracy since you can fire bolts repeatedly at the black and white block. When you are looking for a foam target you want it to be able to last through several practice sessions, without ripping or losing its shape. The Block Black is designed to hold its shape even after being hit repeatedly with arrows, and the innovative polyfusion construction ensures long lasting performance and durability. The foam is strong enough to stop field tips and broadheads, and it is also designed to make arrow removal a breeze. Since you don’t have to struggle to pull the arrows free you won’t have to worry about muscle fatigue. This gives you the advantage of being able to practice longer for a noticeable improvement in aim and accuracy. Since the target measure 16 x 16 x 12 inches, you can easily see it at a distance. This makes the Block Black an excellent choice for beginners and even experienced archers who want to work on improving their aim. The smaller size of the target also makes it easily portable so you can take it with you to the practice range. Weighing only 11 pounds and designed to be easy to carry, this square target might be just what you need to help you improve your archery skills.